1 Macedonian is designated as the primary official language. As of June 2002, any language spoken by at least 20% of the population is also an official language. At present, only Albanian fulfils this requirement, but it can only be used as prescribed by law (e.g. issuing official documents, when communicating with government offices, in municipal self-government) and always in addition to Cyrillic Macedonian. In communities where over 20% of the population speak another language, that language can be used as a municipal official language along with Macedonian and any other official languages; such languages include Turkish, Serbian, Romany and Aromanian. The Republic of Macedonia ( Macedonian: Република Македонија / Republika Makedonija, Albanian: Republika e Maqedonisë), often referred to as Macedonia, is a landlocked country on the Balkan peninsula in southeastern Europe. It borders Serbia to the north, Albania to the west, Greece to the south, and Bulgaria to the east. As the result of a naming dispute with Greece, in 1993 it was admitted to the United Nations under the provisional name the former Yugoslav Republic of Macedonia (FYROM), pending resolution of the dispute. The capital is Skopje, with 500,000 inhabitants, and there are a number of smaller cities, notably Bitola, Prilep, Tetovo, Kumanovo, Ohrid, Veles, Štip, Gostivar and Strumica. It has more than 50 natural and artificial lakes and sixteen mountains higher than 2,000 meters (6,550 ft) above sea level. The country is a member of the UN and the Council of Europe and an associate member of La Francophonie, the World Trade Organization (WTO), the Organisation for Security and Cooperation in Europe. Since December 2005 it is also a candidate for joining the European Union and has applied for NATO membership. 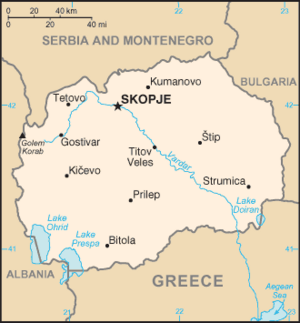 The lands governed by the Republic of Macedonia were previously the southernmost part of the Socialist Federated Republic of Yugoslavia. Its current borders were fixed shortly after World War II when the government of the then People's Federal Republic of Yugoslavia established the People's Republic of Macedonia, recognizing the Macedonian ethnicity, and the region as a separate nation within Yugoslavia. In the past, these lands came under a number of ancient states and former empires; Paionia, the kingdom of ancient Macedon (which gave its name to the whole Macedonian region). It must be noted though, that the ancient kingdom of Macedon was centered in what is known today as Greek Macedonia and its boundaries did not span north of the town Bitola until after 323 BC. Later, in 146 BC, the area became part of the Roman and Byzantine empires, becoming Christian in the 3rd and 4th century. In the late 6th century AD Byzantine control over the area disintegrated, and the region was conquered by pagan Slavic tribes from the north, assimilaing the preexisting Greek, Latin, Illyrian and Thracian-speaking inhabitants . In the 9th century the territory converted to Christianity through the evangelizing work of the Saints Cyril and Methodius and their disciples. In the same century the First Bulgarian Empire assumed control of most of the area. The Byzantines reassumed full control of the Balkans by the early 11th century, but by the late 12th century Byzantine decline brought about the birth of the Second Bulgarian Empire. The empire met with political difficulties early, and the wider geographical Macedonia region fell once again under Byzantine control, and in the 14th century it became part of the Serbian Empire, only to pass a few decades later into Ottoman hands, under whose rule it was to remain for five centuries. Several movements whose goals where the establishment of an independent Macedonian state encompassing the entire region of Macedonia began to arise in the mid and late 1800's, the most famous of these the IMRO. In 1903 IMRO organised the Ilinden Uprising against the Ottomans, which after the initial successes including the forming of the Krushevo Republic, was crushed with much loss of life. The uprising and the forming of the Krushevo Republic are considered the corner-stone and precursors to the eventual establishment of the Republic of Macedonia. Following the two Balkan wars of 1912 and 1913 and the dissolution of the Ottoman Empire, the wider region of Macedonia was divided between Greece, Bulgaria and Serbia. The territory of the present-day Republic of Macedonia was then named Južna Srbija, " Southern Serbia". After the First World War Serbia joined the newly formed Kingdom of Serbs, Croats and Slovenes. In 1929, the kingdom was officially renamed the Kingdom of Yugoslavia and divided into provinces called banovinas. So called "Southern Serbia" ( Vardar Macedonia), including all of what is now the Republic of Macedonia, became known as the Vardar Banovina of the Kingdom of Yugoslavia. In 1941, Yugoslavia was occupied by the Axis Powers and the Vardar Banovina was divided between Bulgaria and Italian-occupied Albania. Harsh rule by the occupying forces encouraged many Macedonians to support the Communist Partisan resistance movement of Josip Broz Tito. After the end of the Second World War, when Tito became Yugoslavia's president, the People's Federal Republic of Yugoslavia was established. The People's Republic of Macedonia became one of the six republics of the Yugoslav federation. Following the federation's renaming as the Socialist Federal Republic of Yugoslavia in 1963, the People's Republic of Macedonia was likewise renamed, becoming the Socialist Republic of Macedonia. 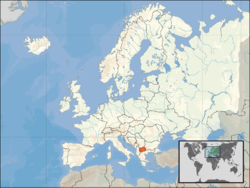 It dropped the "Socialist" from its name in 1991 when it peacefully seceded from Yugoslavia. A few very minor changes to its border with Serbia were agreed upon to resolve problems with the demarcation line between the two countries. The country officially celebrates 8 September 1991 as Independence day, with regard to the referendum, endorsing independence from Yugoslavia, albeit legalizing participation in future union of the former states of Yugoslavia. The anniversary of the Ilinden Uprising (St. Elijah's Day) on the 2 August is also widely celebrated on an official level. The Republic of Macedonia remained at peace through the Yugoslav wars of the early 1990s but was destabilized by the Kosovo War in 1999, when an estimated 360,000 ethnic Albanian refugees from Kosovo took refuge in the country. Although they departed shortly after the war, soon after, Albanian radicals on both sides of the border took up arms in pursuit of autonomy or independence for the Albanian-populated areas of the Republic. A short war was fought between government and ethnic Albanian rebels, mostly in the north and west of the country, in March–June 2001. This war ended with the intervention of a NATO ceasefire monitoring force. In the Ohrid Agreement, the government agreed to devolve greater political power and cultural recognition to the Albanian minority. The Albanian side agreed to give up any separatist demands and to fully recognise all Macedonian institutions. In addition, according to this accord the NLA was to disarm and hand over their weapons to a NATO force. In 2005, the country was officially recognized, under the name Former Yugoslav Republic of Macedonia, as a European Union candidate state. The Republic of Macedonia is a parliamentary democracy with an executive government composed of a coalition of parties from the unicameral legislature (Собрание, Sobranie) and an independent judicial branch with a constitutional court. The Assembly is made up of 120 seats and the members are elected every four years. The role of the President of the Republic is mostly ceremonial, with the real power resting in the hands of the President of the Government. The President is the commander-in-chief of the state armed forces and a president of the state Security Council. The President of the Republic is elected every five years and he or she can be elected twice at most. The current President is Branko Crvenkovski. With the passage of a new law and elections held in 2005, local government functions are divided between 78 municipalities (општини, opštini; singular: општина, opština). The capital, Skopje, is governed as a group of ten municipalities collectively referred to as "the City of Skopje". Municipalities in the Republic of Macedonia are units of local self-government. Neighbouring municipalities may establish cooperative arrangements. 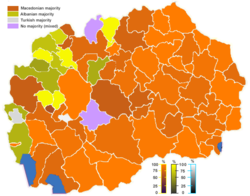 The country's main political divergence is between the largely ethnically-based political parties representing the country's ethnic Macedonian majority and Albanian minority. The issue of the power balance between the two communities led to a brief war in 2001, following which a power-sharing agreement was reached. In August 2004, the Republic's parliament passed legislation redrawing local boundaries and giving greater local autonomy to ethnic Albanians in areas where they predominate. After a troublesome pre-election campaign, the country saw a relatively calm and democratic change of government in the elections held on 5 July 2006. The elections were marked by a decisive victory of the centre-right party VMRO-DPMNE led by Nikola Gruevski. Gruevski's decision to include the Democratic Party of Albanians in the new government, instead of the Democratic Union for Integration - Party for Democratic Prosperity coalition which won the majority of the Albanian votes, triggered protests throughout the Albanian-dominated parts of the country. The Republic of Macedonia is a member of a number of international organisations such as the United Nations, Organisation for Security and Cooperation in Europe Council of Europe, associate member of La Francophonie, World Trade Organization (WTO) etc. It is seeking to join NATO and the European Union, although its accession to either is unlikely to occur before 2008 and 2012, respectively. In December 2005, the leaders of the EU formally named it as a candidate country but did not set a date for starting entry talks. The United States Agency for International Development has underwritten a project called Macedonia Connects which has made the Republic of Macedonia the first all broadband wireless country its size or larger in the world. The Ministry of Education and Sciences reports that 461 schools (primary and secondary) are now connected to the internet. In addition, the Internet Service Provider named On.net has created a MESH Network to provide WIFI services in the 11 largest cities/towns in the country. The Republic of Macedonia is represented abroad by embassies in the following countries: Albania, Australia, Austria, Belgium, Bosnia and Herzegovina, Bulgaria, Canada, Croatia, Denmark, Egypt, France, Germany, Greece, Hungary, Italy, the Netherlands, People's Republic of China, Poland, Qatar, Romania, Russia, Serbia, Slovenia, Spain, Sweden, Switzerland, Turkey, Ukraine, United Kingdom, United States, and the Vatican. The Republic of Macedonia also maintains consulates or representative offices in Pristina, Serbia; Thessaloniki, Greece; Toronto, Canada; Detroit, USA; Istanbul, Turkey and Podgorica, Montenegro. There are also permanent missions at the UN, NATO, EU, UNESCO, Council of Europe, and FAO headquarters. There is currently no representation in Taiwan (Republic of China) since 2001 when diplomatic relations were formally severed between the two countries and the Macedonian embassy in Beijing was reopened. The Republic of Macedonia generally has good relations with Greece and includes substantial foreign investment to the Republic of Macedonia from Greece. However, the naming dispute has inhibited the establishment of full diplomatic relations so far but has not prevented Greece and the Republic from engaging in military and security co-operation, cross-border investments, and cultural exchanges. The November 2005 European Commission report states that, "Relations with Greece have improved in the last few years. Greece is the most important investor in the country (57% of the total foreign investments) and trade has been constantly increasing." Former Greek foreign minister, M. Papakonstandinou, clearly expressed Athens' position towards the republic, "Greek interests demand that this state survives. It must exist [...] This is the firm position of [both ND and PASOK]." (ref: Interview with the minister. In, 'Andi' (weekly socio-political journal), Nr 588, 13 October 1995). Due to the dispute over the name, the United Nations agreed to a provisional name — "the former Yugoslav Republic of Macedonia" (FYROM) ( Macedonian: Поранешна Југословенска Република Македонија (ПЈРМ)) — when it became a member state in 1993 . Most international organizations adopted the same convention, including the European Union, NATO, the International Monetary Fund, the European Broadcasting Union, and the International Olympic Committee, among others. The EU recognises the country as the former Yugoslav Republic of Macedonia (FYROM) and the negotiations with the EU are held using this reference , . However, an increasing number of countries have abandoned the United Nations provisional references and have recognised the country as the Republic of Macedonia instead. These include three of the five permanent UN Security Council members: the United States, Russia, and the People's Republic of China, although as the UN name for the country is FYROM, the constitutional name is only used in relations where a state not recognizing it is not a party. From 1992 to 1995, the two countries also engaged in a dispute over the Republic's first flag, which incorporated the Vergina Sun symbol, a symbol of the ancient Kingdom of Macedon. Its adoption by the Republic of Macedonia, on 3 July 1992, was seen as a reaction by Skopje to Athens' pressure to change the name. This aspect of the dispute was permanently resolved after an interim accord between the two states, when the flag was changed by an act of parliament, in October 1995. The Republic of Macedonia maintains good relations with the Republic of Bulgaria. Bulgaria was the first country to recognize Macedonian independence and the republic under its constitutional name. Many Macedonian students matriculate in Bulgarian universities. Bulgaria also supports the Macedonian bid to enter the EU and NATO. Bulgaria also donated a large amount of tanks, artillery and other materials to the Macedonian army. The basic problem in the relationship between the Republic of Macedonia and Bulgaria is the latter's refusal to recognise the existence of a separate Macedonian ethnicity, instead considering Macedonians to be Bulgarians and their language as a regional "norm" based on local Bulgarian dialects . The so called "language dispute", which started in 1993 and was effectively impeding diplomatic relations, was resolved in 1999 when the two governments adopted the formula "Macedonian language according to the constitution of the Republic of Macedonia" and "Bulgarian language according to the constitution of the Republic of Bulgaria" in their bilateral agreements where they use the Macedonian and Bulgarian languages. Issues have also been raised over what many Bulgarians view as appropriation and falsification of their history, and the treatment in the Republic of Macedonia of people espousing a Bulgarian national identity. The organization of the Bulgarian minority in the Republic of Macedonia "Radko" for example (which was later banned by the Macedonian Constitutional Court) had been publicly harassed after they claimed that there is no Macedonian ethnicity today, and the perpetrators were acclaimed as heroes by the media. Similarly, the Bulgarian Constitutional Court has banned the political party of the ethnic Macedonians in Bulgaria UMO Ilinden-Pirin as separatist; this measure was found not to be "proportionate to the legitimate aim pursued" on October 20, 2005 by the European Court of Human Rights. The EU leaders on the meeting held in Thessaloniki in 2003 promised western Balkan countries that they will become an integral part of the EU, once they meet the established criteria. As part of the ongoing efforts to expand its membership, the European Union (EU) granted the Republic of Macedonia candidate status on 17 December 2005, but with no promise of when such negotiations could start. France had made a budget deal as a condition for granting the Former Yugoslav Republic of Macedonia candidate status and Greece agreed not to veto the decision on the premise that the name dispute will be resolved. The Former Yugoslav Republic of Macedonia applied for full membership on 22 March 2004. Vlado Bučkovski, then minister of defence and later prime minister, hailed the decision as a "one-way ticket" to the EU for his country. The country is still included in the black visa list of the EU . According to the EU, namely in accordance with its Copenhagen criteria, the main obstacles towards eventual EU membership for Republic of Macedonia concern good relations with neighbouring countries and reforms to its judicial and police systems. Also, growth rate lags behind that of most EU members, unemployment is high, and foreign investment is relatively low. The decentralisation process imposed after the six-month conflict in 2001 still requires full implementation. In principle, the relatively low population and European characteristics of the Republic promise few strains on the EU budget. On a press conference held in March 2006, German chancellor Angela Merkel suggested a privileged partnership for potential members. Following the refusals of European constitution by the French and Dutch voters, EU is in a period of reflection (time to decide what to do next) that can last for several years. This decision seems to delay the prospect of EU membership for candidates like Croatia, the Former Yugoslav Republic of Macedonia and Turkey for some period. French warned that they want strict application of the notion of absorption capacity for the EU - a concept which has existed since 1993 but which has rarely been highlighted. Another problem in the relations between the EU and the Republic of Macedonia is the EU visa regime with the country, fostering resentment and inhibiting progress on trade, business, education etc, contributing negatively to regional stability. . In February 2006, the Republic became the fourth member of the Central European Free Trade Agreement (CEFTA), joining Croatia, Bulgaria and Romania. CEFTA acts as ' sandbox' to encourage joint efforts for the integration of participating countries in Western European institutions and look for opportunities for close economic and political co-operation. A factor of outmost importance for the country's accession to the EU, is that of the naming dispute with Greece. On August 29, 2006, the Greek foreign minister, Ms. Dora Bakoyannis, affirmed that "...the Hellenic Parliament, under any composition, will not ratify the accession of the neighbouring country to the EU and NATO if the name issue is not resolved beforehand." More recently, EU sources have confirmed that the Republic of Macedonia's hope of starting accession talks next year cannot succeed, since its new prime minister Nikola Gruevski has shut out the former Yugoslav republic's ethnic Albanian minority and has politicised many state institutions. 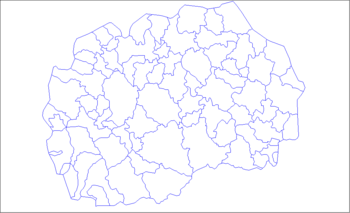 In August 2004, the Republic of Macedonia was reorganized into 84 municipalities (opštini; sing. opština), 10 of which comprise Greater Skopje. This is reduced from the previous 123 municipalities established in September, 1996. Prior to this, local government was organized into 34 administrative districts. The Republic of Macedonia is a landlocked country that is geographically clearly defined by a central valley formed by the Vardar river and framed along its borders by mountain ranges. The Republic's terrain is mostly rugged, located between the Šara and Rhodope, which frame the valley of the Vardar river. Three large lakes — Lake Ohrid, Lake Prespa and Dojran Lake — lie on the southern borders of the Republic, bisected by the frontiers with Albania and Greece. Ohrid is considered to be one of the oldest lakes and biotopes in the world . The region is seismically active and has been the site of destructive earthquakes in the past, most recently in 1963 when Skopje was heavily damaged by a major earthquake, killing over 1,000. Today the Republic of Macedonia is considered a country with an intermediary-developed industry, with continuing growth of the industrial production. The process of transition in the economy was triggered in 1995. The government has signed arrangements with the IMF ( International Monetary Fund) and World Bank. It has an open economy that is integrating into international trade, with a total trade-to- GDP ratio of 79.5%. The most important sectors are agriculture and industry. The service sector also grew in the past few years. Work force education and skills are competitive, but without adequate jobs leading to steady brain drain. The country's economic policy is to attract foreign investments and to increase the employment rate. One of the biggest features of the country`s economy is the fiscal discipline which maintained a stable currency for a long period. The country also makes effort to develop the Small and Medium-Sized Enterprise sector. Looking back, the country together with Montenegro, Bosnia and Hercegovina and Kosovo belonged to the less developed regions in the former Yugoslavia. It suffered severe economic difficulties after independence, when the Yugoslav internal market collapsed and subsidies from Belgrade ended. In addition, it faced many of the same problems faced by other former socialist East European countries during the transition to a market economy. Its main land and rail exports route, through Serbia, remains unreliable with high transit costs, thereby affecting the export of its formerly highly profitable, early vegetables market to Germany. The outbreak of the Yugoslav wars and the imposition of sanctions on Serbia and Montenegro caused great damage to the Republic's economy, with Serbia constituting 60% of its markets prior to the disintegration of Yugoslavia. When Greece imposed a trade embargo on the Republic in 1994–95, the economy was also affected. Some relief was afforded by the end of the Bosnian war in November 1995 and the lifting of the Greek embargo, but the Kosovo War of 1999 and the 2001 Albanian crisis caused further destabilization. Since the end of the Greek embargo, Greece has become the most important business partner of the Republic of Macedonia. Many Greek companies have bought former state companies in the country, such as the oil refinery Okta, the baking company Zhito Luks, marble mine in Prilep, textile facilities in Bitola etc. Other key partners are Germany, Italy and Slovenia. The Macedonian economy has since made a sluggish recovery, though the extent of unemployment, the grey market, corruption and a relatively ineffective legal system keep the growth rate low and cause significant problems. The Republic still has one of the lowest per capita GDPs in Europe. The official unemployment rate is 38%. The active population numbers 877,798 people with 318,096 of them unemployed. However, many of the employed go unreported, therefore it is more than likely that the unemployment rate is closer to 25%. This is reflected in the large grey market, estimated at close to 20% of GDP. Growth barely recovered in 2002 to 0.9%, then rose by 3.4% in 2003, 2.9% in 2004, and 3.7% in 2005. The past few years saw a significant rise in the economy and with the recent candidacy for the EU, the country should be making rapid progress. The Republic of Macedonia is an ethnically diverse country. The largest ethnic group in the country are the Macedonians. In the last population census, approximately 1,300,000 inhabitants declared themselves to be Macedonians, representing 64.2% of the total population. Approximately 500,000 inhabitants are declared as Albanians, representing 25.2% of the population. They are concentrated mostly in the western and north-western part of the country. Smaller minorities include Turks (78,000 or 3.9%), Roma (54,000 or 2.7%), Serbs (36,000 or 1.8%) and Vlachs (mostly Aromanians, but also 2.000 Megleno-Romanians in Uma (Huma)) called in the census (9695 or 0.4%). Bosniaks in the census represent 0.9% of total population. In smaller numbers, many other minorities exist, namely Montenegrins, Croats, Slovenes (all constituting a small presence of people from the former Yugoslavia), Egyptians, Circassians, Greeks, Bulgarians and others. These other minorities account for less than 2.5% of the population of the country. The Macedonian national census records most ethnic groups, but the smaller ones are not enumerated separately in the final report. A wide variety of languages are spoken in the Republic of Macedonia, reflecting its ethnic diversity. The official and most widely spoken language is Macedonian, which belongs to the Eastern branch of the South Slavic language group. Structurally, it is closer to Bulgarian than any other Slavonic language. Its current form was codified after World War II and has accumulated a thriving literary tradition. Other languages including Albanian, Turkish, Serbian, Aromanian, Romani, Megleno-Romanian, Circassian, Bulgarian, Greek and others are spoken roughly in proportion with their associated ethnic groups. Macedonian is the only language designated as the country's official national language. Languages spoken by over 20% of the total population can be used for some official purposes, in some allowed areas (at present only Albanian fulfils this requirement), in municipalities where at least 20% of the population is from other ethnic minorities their individual languages are used for official purposes in local government. The majority of the population belongs to the Macedonian Orthodox Church (64.7%). Muslims comprise 33.3% of the population and other Christian denominations comprise 0.37%. The remainder (1.63%) is recorded as "unspecified" in the 2002 national census . Most of the native Albanians, Turks and Bosniaks are Muslims, as are a minority of the country's ethnic Slavic Macedonian population, known as Macedonian Muslims. Altogether, there are more than 1200 churches and 400 mosques in the country. The Orthodox and Islamic religious communities have secondary religion schools in Skopje. There is an Orthodox Theological college in the capital. The Macedonian Orthodox Church has issues with the Serbian Orthodox Church after the separation and self-declaration of autocephaly (not recognized by any other Orthodox church) in 1967. After the negotiations between the two churches were suspended, the Serbian Orthodox Church recognized a schismatic group lead by Zoran Vranishkovski (also known as Archbishop Jovan of Ohrid, recognised by all other Eastern Orthodox Churches), a former Macedonian church bishop, as the Orthodox Ohrid Archbishopric. The reaction of the Macedonian Orthodox Church was to cut-off all relations with the clergy of the Ohrid Archbishopric and to prevent bishops of the Serbian Orthodox Church from entering the Republic of Macedonia. Bishop Jovan was jailed for 18 months for defaming the Macedonian Orthodox church and harming the religious feelings of local citizens. . The Macedonian State Religion Commission denies the group to be registered as a religious group saying that only one group may be registered for each confession and that the name was not sufficiently distinct from that of the Macedonian Orthodox Church. The Macedonian church had acquired documents confirming direct involvement of the Serbian government in financing the activities of the group, seen as interference in the internal affairs of another sovereign state by the Macedonian President Crvenkovski. . The Macedonian President also rejected the request of the Head of the Serbian Orthodox Church for abolition of Zoran Vranishkovski (set as a main condition for resumption of negotiations between two churches by the Serbian Patriarch). Vranishkovski is convicted of misappropriate usage of a large sum of money donated to the Macedonian Orthodox Church. The Macedonian Byzantine Catholic Church (also known as the Macedonian Greek Catholic Church) has approximately 11,000 adherents in the Republic. The Church was established in 1918, and is made up mostly of converts to Catholicism and their descendents. The Church is a Byzantine Rite within the Roman Catholic Church, and conducts its liturgy in Macedonian. There is a small Protestant community, many of them converts since the 1980s following the arrival of preachers from the USA and Germany. The most famous member was the former President of the country, Boris Trajkovski. The higher levels of education can be obtained at one of the three state universities: Ss. Cyril and Methodius University of Skopje, St. Clement of Ohrid University of Bitola and State University of Tetovo. There is a number of private university institutions, such as the European University , the South East European University and others. The Republic of Macedonia has a rich cultural heritage in art, architecture, poetry, and music. It has many ancient, protected religious sites. Poetry, cinema, and music festivals are held annually. Macedonian music styles developed under the strong influence of Byzantine church music. The Republic of Macedonia is amongst one of the countries with the most beautiful preserved Byzantine fresco paintings, mainly from the period between the 11th and 16th centuries. There are several thousands square metres of fresco painting preserved, the major part of which is in very good condition and represent masterworks of the Macedonian School of ecclesiastical painting. In the Republic of Macedonia the past meets the present. Its age-old architecture and monasteries and churches of exquisite beauty make an interesting contrast to the super modern new architecture. Most of the Macedonian monasteries, built in various periods, and particularly those built between the 11th and 15th–16th centuries, have been completely preserved until today. The Macedonian collection of icons, and in particular the Ohrid ones, are among the most valuable collections in the world today. After the Sinai and the Moscow collection of icons, it is third in importance in Orthodoxy. From a Byzantological aspect, it is unique. The most important cultural events in the country are the Ohrid Summer festival of classical music and drama, the Struga Poetry evenings which gather poets from more than 50 countries in the world, Skopje May Opera Evenings, International Camera Festival in Bitola, Open Youth Theatre and Jazz festivals in Skopje etc.